These layered creations are literally bursting with flavor. Give them a try and you’ll love the jammy surprise. Doughnut muffin you ask? Don’t worry this is not some crazy concoction of mine they are just a muffin. 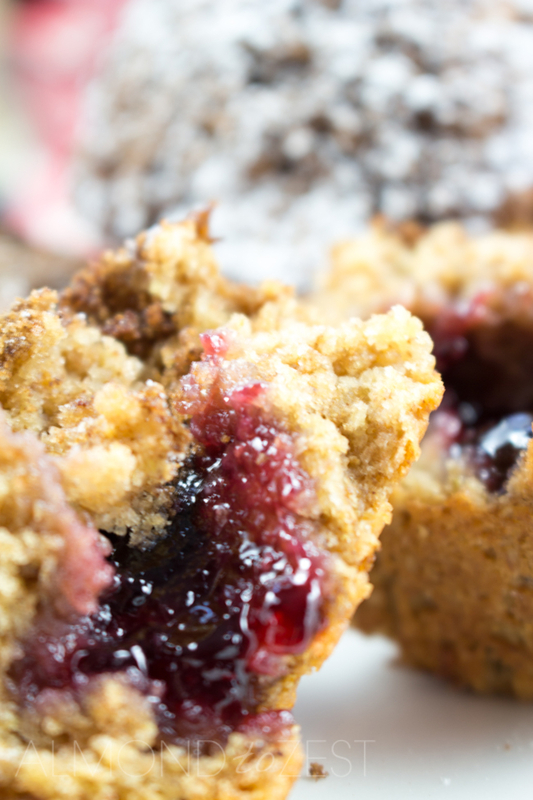 I simply call them a doughnut muffin as they remind me of those warm round doughnut that look utterly boring from the outside, but then you bite into them and hot berry jam comes squirting out and then they become amazing. Well that is exactly what happens with these muffins except they are even better because of their scrumptious crumbly topping. 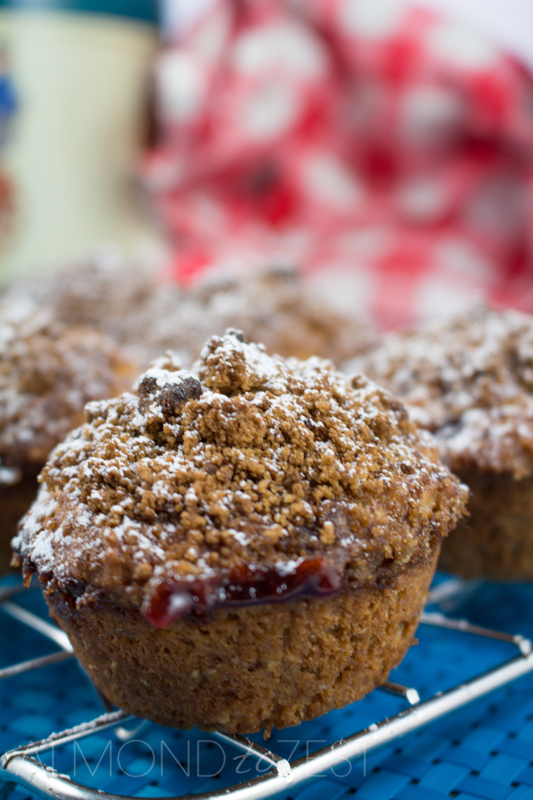 I am a big fan of using whole-wheat flour in muffins. It gives such a depth in flavor and a texture that I adore. Plus it’s so much better for you, which means you can eat twice as much. Right? Well that’s what I have convinced myself into believing anyway. These muffins require a little bit more time and effort to put together than other recipes, but the construction is well worth it. 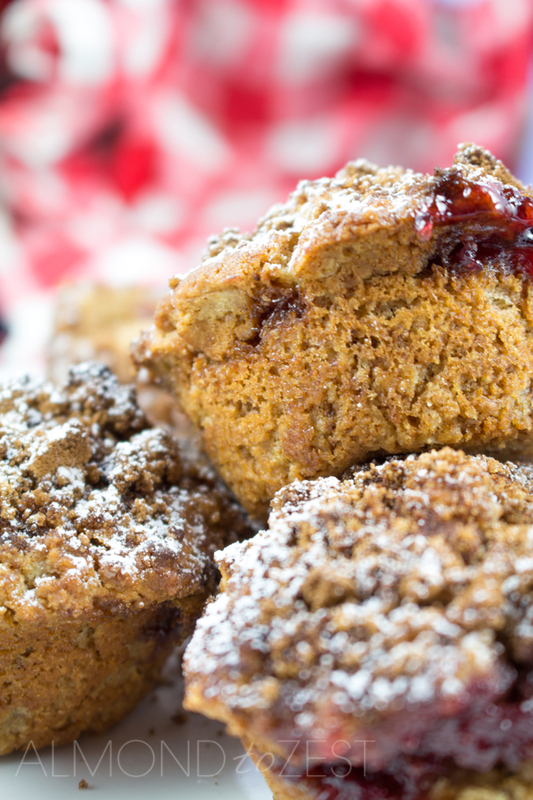 A combination of brown sugar and cinnamon makes the crumble on top of these muffins to die for. 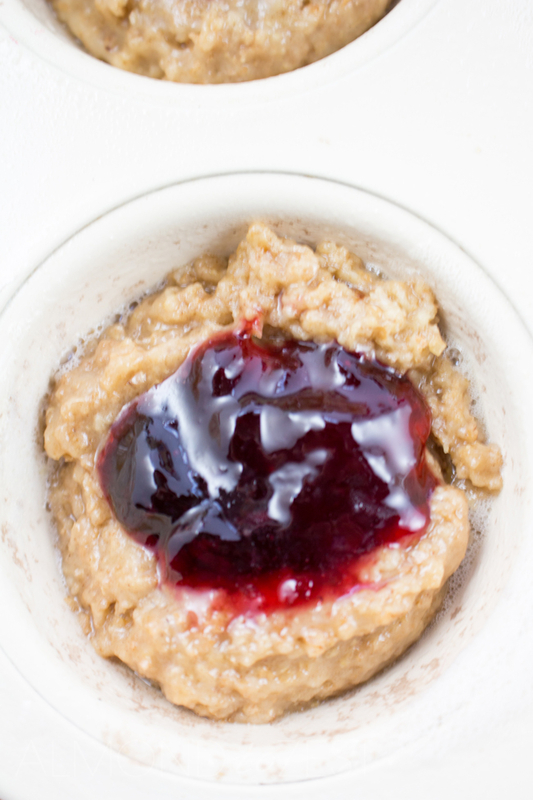 The spice and sweet flavors work in perfectly with the hot berry jam filling. Cinnamon has many health benefits; it is known to reduce the risk of heart disease, reduce cholesterol levels and helps insulin to lower blood sugar levels. Another reason to try these today. 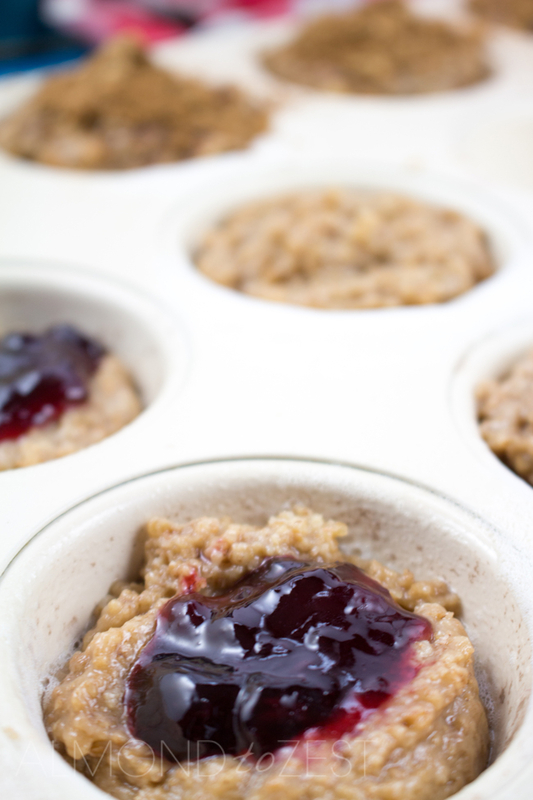 Set your oven to 350 (180C) and grease or spray 8 holes in a 12-count muffin pan. 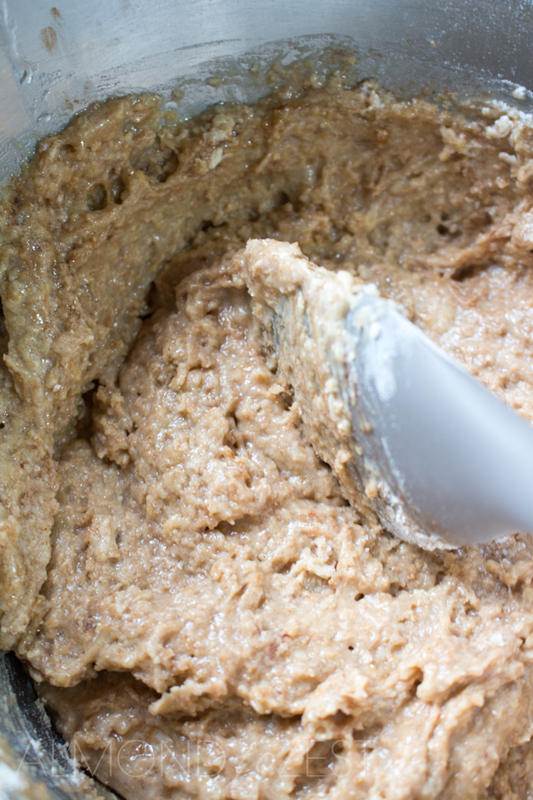 This recipe makes 8 muffins so you could double it and do 16 in 2 batches. Grab 2 mixing bowls. 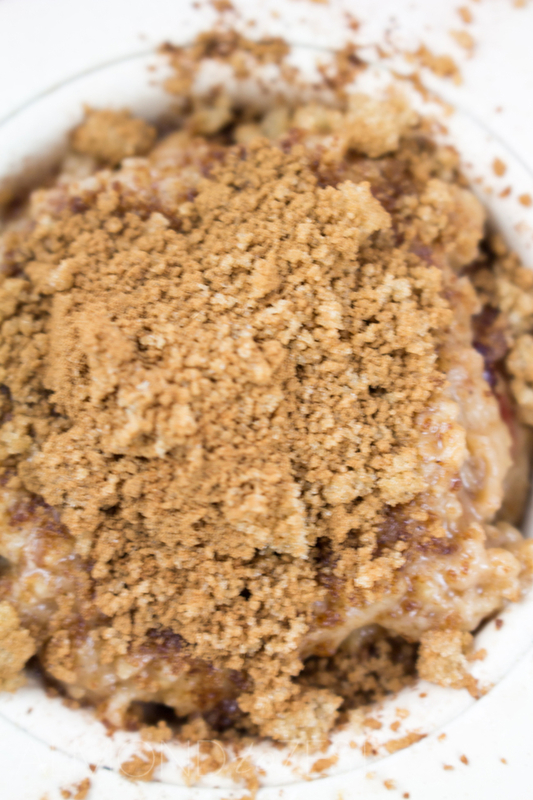 Sift together the whole-wheat flour, baking powder and cinnamon in a one of the then add the brown sugar. In the other crack the free range eggs and add the canola oil and milk. Lightly beat this mix together then add to the dry ingredients and mix until just combines. As always with muffins, take care not to over mix. Spoon half the mixture into each muffin hole then make a slight well in the mix and add the jam, take care to carefully place it in the middle of the muffin as otherwise it can spill out during the cooking process. 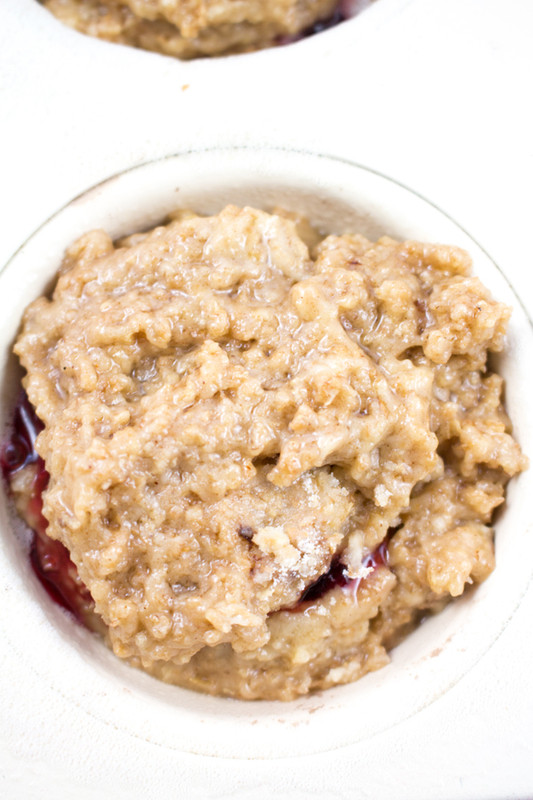 Then place the other half of the muffin mixture on top, pressing down around the edges gently to seal the jam inside. 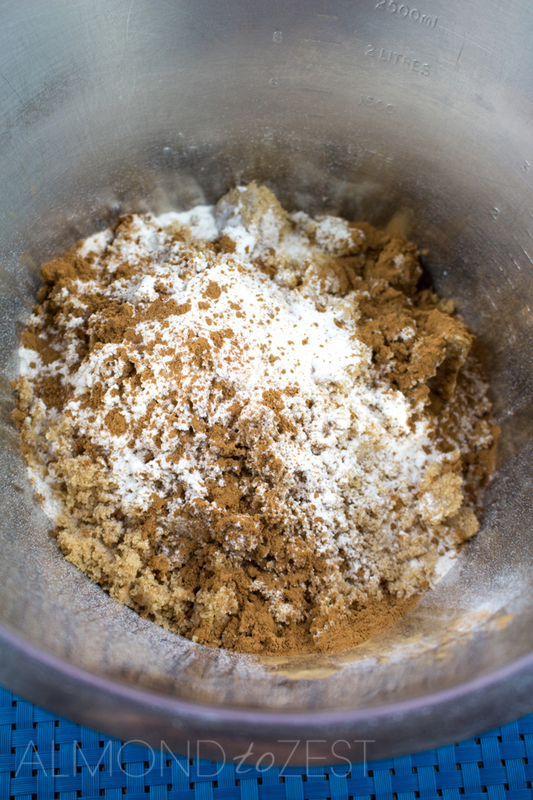 Mix the remaining brown sugar and cinnamon powder together and sprinkle on top of the muffins. Bake for 15 -20 minutes until done. Let cool in pan for 5 minutes before turning out. Take care, if you eat tem straight away the jam may be very hot! These were DELICIOUS!! A huge hit with my family!! Hi Tiffany, glad your family enjoyed them. Thanks for trying our recipes! These turned out pretty and delicious! I used whole wheat pastry flour, added a pinch of salt and some vanilla, and used turbinado sugar on top. Hey Jodi, that’s awesome, the turbinado sugar on top sounds like a great idea. I’m gonna try that next time I make them. Thanks for checking out our site!